When I asked them what it was about, they said their aim was to gather 100,000 votes before the 1916 celebrations next year to show a strong support for a united Ireland. My (sometimes) reasoned mind jolted awake, and I simply remembered that I had something else to do, anywhere else. Even when I was younger, and the troubles were at their rawest, I could never buy into the pollyanna notion of a united Ireland. That somehow having a 32 county Ireland would be a healing panacea. Never mind the Protestant part of the Northern community, who would not want to be brought into a newly old united Ireland. How would the Irish Republic deal with the economic costs of trying to integrate the current majority, with a proudly different culture. Only the deep pocketed London government, could have afforded to sustain the northern economy, especially during the worst decades. A Nation once again, conjures up a dreamy to some, image of people in green tops with maybe a hint of orange, dancing at the crossroads,lost in a giddy emerald illusion. Given the overwhelming support for the Good Friday agreement and the enthusiastic reception given to Queen Elizabeth, is this not a sign that (if they want to use broad labels) the majority of people in the republic, could be classified as catholic unionists. I remember a talk given in UCD in ’96 (I think, by someone I have long forgotten), decrying the predictions that there would be more catholic babies born than protestant babies within the next few decades. As he said to loud applause, that their are only babies born. A particular religious indoctrination or any other social mark comes second. This has now materialised of course, and indeed 1916 will mark the first year when Catholics are on a par ( population wise) wìth their Protestant counterparts. Hopefully there will never be a return to violence, and I strongly believe that the 6 counties are far better off the way they are, with both traditions respected. The shoe had been on the other foot for a long time and neither side has a monopoly on suffering or grief. History is tomorrow’ view of the present, so there is absolutely no point in trying to ignore the rooted English presence here. Didn’t the people of the land of saints and scholars vote a resounding “yes” to the Good Friday Agreement, with its power sharing objectives? 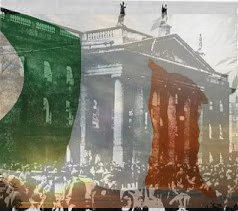 Whether or not (and I think it will) the spirit of 1916 is commandeered by blind nationalism, I am very proud of their enduring sacrifice and the freedom they secured from colonial living. Hopefully the celebrations next year will (hopefully) not be manipulated, or the tone given over too easily to a dictated nationalism. What it means to be Irish has certainly evolved and matured. Hopefully nationalism and what it means to be Irish has expanded a little. I am very much a lover of history, I just don’t have that much regard for idealistic fantasies, or the dogged bloodymindedness seemingly needed to achieve them. In many ways, we are an unrecognisable tribe, from those now found only in weathered history books. I am sure though that the modern Ireland with its divorce, marriage equality and inhabitants of many colours, would have been looked on as worth every blasted effort and incarcerated sacrifice! No comments A Nation once again: music to deaf ears?.